Now, what does that actually mean, "Ja-Choong Soo"? 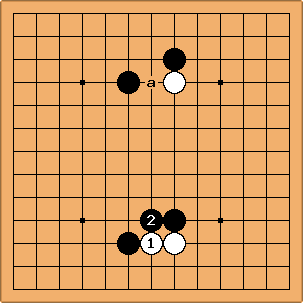 충 (choong) -> "filling up"
The term Ja-Choong Soo refers to a move at a board point with significantly reduced liberties, making only the touched opponent's position stronger. So, this kind of move is a precious instance of "thank you moves". Methaphorically, it can be treated as (generalized) self-atari. To grasp the meaning of Ja-Choong Soo properly, let us reverse our common goal for a moment and look for particularly bad moves rather than for the best ones. In this hypothetical position, where is white's worst play? It is easy to spot. is the worst play for White - a self-atari move, minimizing its own liberties. 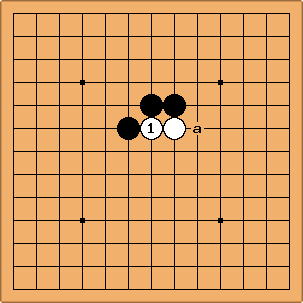 After this move, Black will take it playing at a, and get a ponnuki in the center happily, as shown in the next diagram. Here is another case of "Ja-Choong Soo". also belongs to Ja-Choong moves, even though it is not literally a self-atari. By , White reduces the liberties of the own stones such that Black can capture them in a ladder. Suicidal play from White. A slightly subtler case of Ja-Choong Soo. Unlike in the previous examples, Black can not simply take the white stones, nor capture them in a ladder. But this is hardly different in that it is still a self-damaging, dull move, played as if White tried to get as few liberties as possible. Black will play at a next, beating the (second) head of White's 2 stones, which weakens their position enormously. This one is a bit harder to recognize. 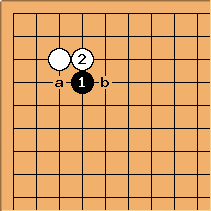 To commit "Ja-Choong Soo", White can play at a - a very effective way to get an unfavorable position by minimizing own liberties. At the bottom, we can see the follow-up. White played a "diagonal approach" at , and Black pushed against it, with . Everything is ok, so far. Now, it's W's turn to make "Ja-Choong Soo". How can White cause to get a really bad local position? is the solution. With that move, White succeedes to smother the own stones, since it minimizes their liberties. 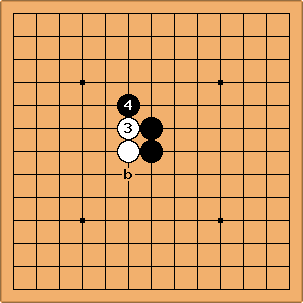 Black will get an advantageous result in this local fight easily by responding at ( or b). 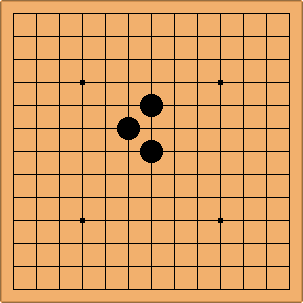 In fact, we can make "Ja-Choong moves" even without any help from opponent's stones. Let's begin with a simple group of 2 black stones, as shown in the upper left corner below. Forming clumsy shapes with single colored "Ja-Choong moves"
is a good start to make "Ja-Choong move". is also an effective way to remove "roads to breath" with own stones. Now, 4 black stones are working against themselves. 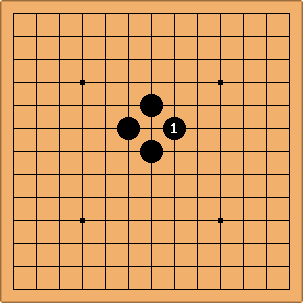 And we can continue to play "Ja-Choong moves" as shown in the other cases. This position can occur after White's invasion . Black's turn to play. 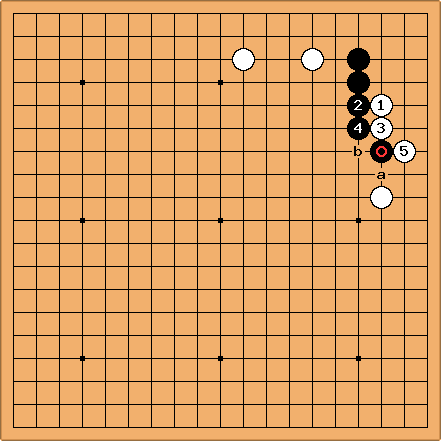 How to weaken the strength of the marked black stone and create bad aji in Black's position by making an amatuerish, vulgar Ja-Choong move? Choose your answer between a and b. This is White's turn to play. White attacked Black with the shoulder hit . Black followed the natural flow of stones and pushed with . 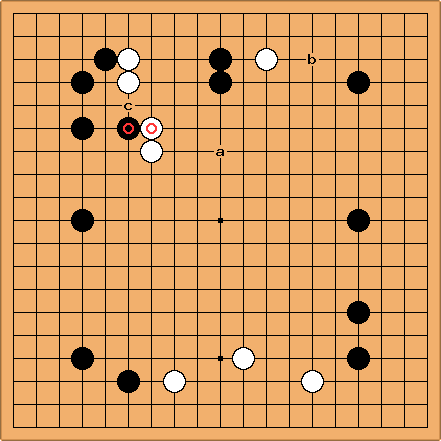 Now, White gets a good chance to spoil the game with a well-chosen Ja-Choong move. Decide between a and b. 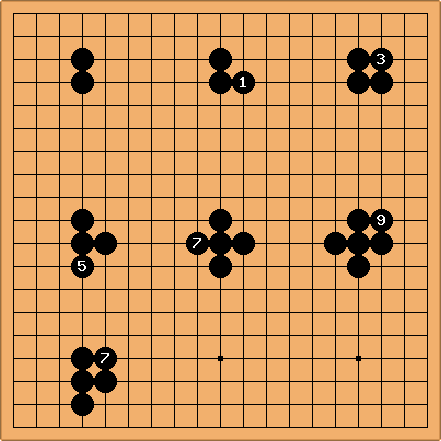 This is one of the possible sequences with White at 3-3. After , choose your answer between a and b, to form a horrible position for Black. W's turn to play. As you probably know, this is a basic hoshi joseki. 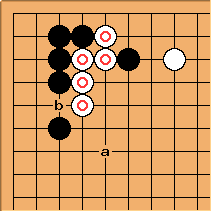 Anyway, to effectively hurt the marked white stones and allow Black to remove bad aji by reducing W's liberties, which of the following 3 options is the best white continuation? (1) play at a, (2) at b (3) doing nothing, play elsewhere. I took this position from one of my recent teaching games. How can Black make the marked weak white stones stronger and thicker, with a black stone remaining vulnerable? Pick the "Ja-Choongest" move. 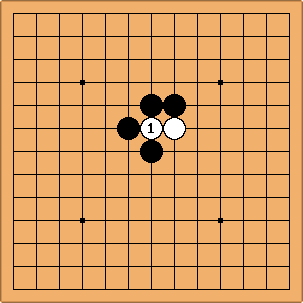 2 more moves are played from the previous situation, and it's Black's turn again. Choose your favorite way to support the weak white stones, from a to c.
White played to reduce Black's right side formation. is a natural and normal response. How to keep White's position weak and disadvantageous by own moves? Choose your answer between a and b.